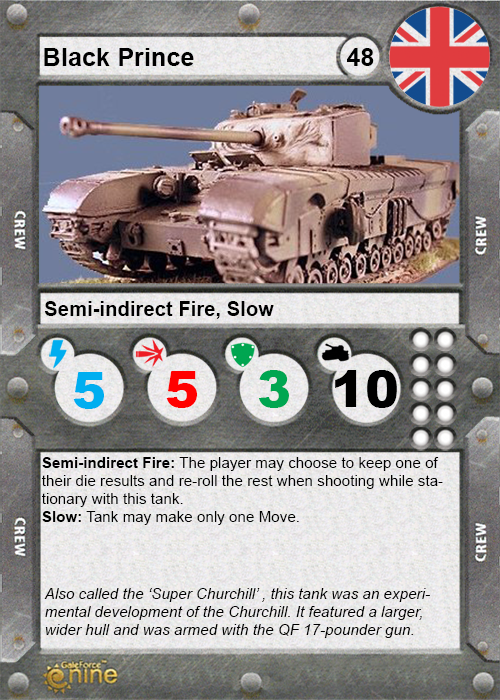 As my son and I are both fans of "what if" wargaming, we've often discussed the idea of introducing prototype tanks into the game. So, for your consideration, here is my first attempt. Comments are welcomed. Admin wrote: As my son and I are both fans of "what if" wargaming, we've often discussed the idea of introducing prototype tanks into the game. So, for your consideration, here is my first attempt. Comments are welcomed. Hmmm, did it have heavier armour than a Tiger II (not Konigs Tiger I mean)? It looks that way from the 3 defense dice compared to a Tiger which has only 2. Black Prince had 152 mm, that's for sure, however, frontal armor of a Tiger II was 185 mm. So am I missing something here, I mean was there effectively more protection to the Black Prince, or was it planned in such a way that even if a penetration was made, it was still less probable to knock it out when compared to a Tiger II? This is the card my friends and I used, based on the calculator created by Craig Melville. Thus far is seems to be reasonably balanced as I have made a number of cards using it. 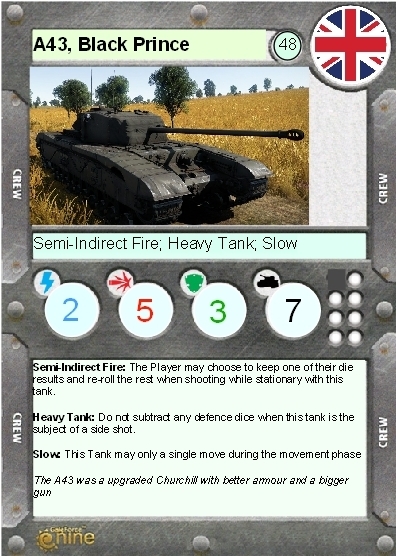 It seems to under-point cheap vehicles, such as the SU-76M card I made. As for the armour discussion. Based on my, thoroughly imperfect, knowledge on tanks on the era the Churchill family were amongst the toughest and most survivable tanks of the war. The forward armour was superior to the Tiger 1. 52% better based purely on simple numbers. However, the side and rear armour was no better than the Tiger 1, which is why I did not give my Black Prince card the 'Heavy Tank' rule. A Tiger II by comparison, in my humble opinion, would warrant armour 3 AND the Heavy Tank rule.